This easy vegan pesto is packed full of fresh basil and delicious flavor. 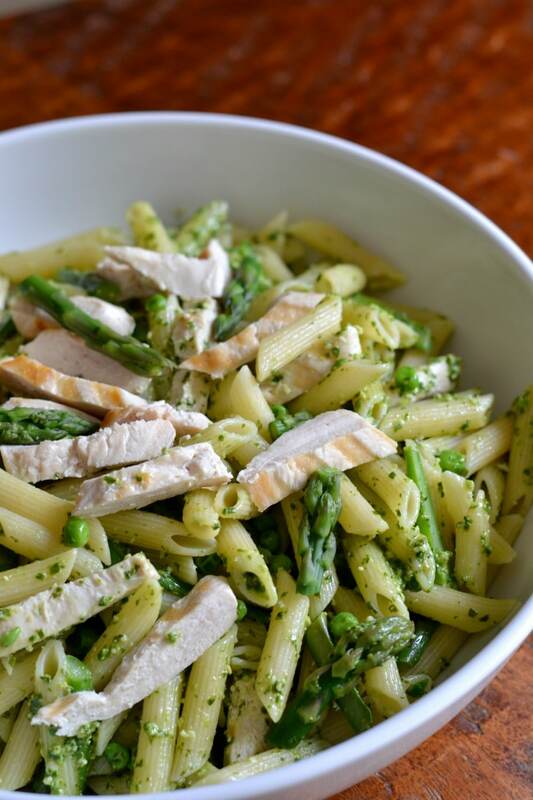 It’s much better than store-bought pesto, and you can make it in minutes! As the weather starts to warm up, and things begin to bloom outside, I start to think about planting some herbs. The first herb that always pops into my mind is BASIL. I love basil. I love it all year round, but during the spring and summer months I could eat it almost every day, in any dish, in any form. One of my favorite things to do when I have an abundance of basil in my garden (or when I see a great deal on basil at the store) is to make pesto. My daughter is allergic to dairy, and therefore can’t tolerate the parmesan cheese in store-bought varieties. When I first started experimenting with making vegan pesto, I expected it to taste like something was missing. But as I continued to tweak the recipe, I discovered that I actually liked pesto better WITHOUT the parmesan cheese. It’s just lighter and fresher (especially with the addition of fresh lemon juice), and the flavors taste brighter. 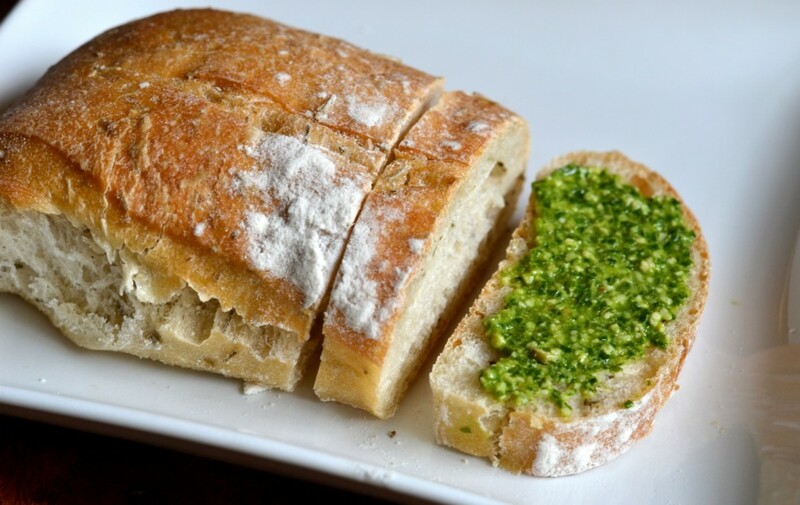 Of course, you can always add cheese to this recipe if you love parmesan in your pesto; or you can do what I do…shave a little bit of fresh parmesan over the top of whatever dish you’re serving with your pesto. 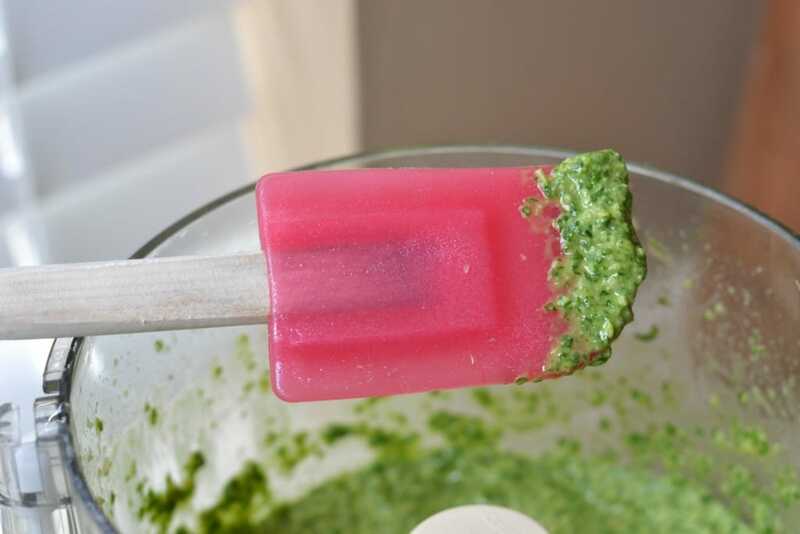 Although I’ve tested this recipe multiple times and these are the proportions that worked best for me, you may need to adjust some of your ingredients after you’ve blended it together. Depending on the age/potency of your lemon, garlic, and salt, you may find them a little too strong or a little too weak for your taste. The nice thing about making pesto is that you can keep adding a little of this and a little of that until it comes out completely perfect. 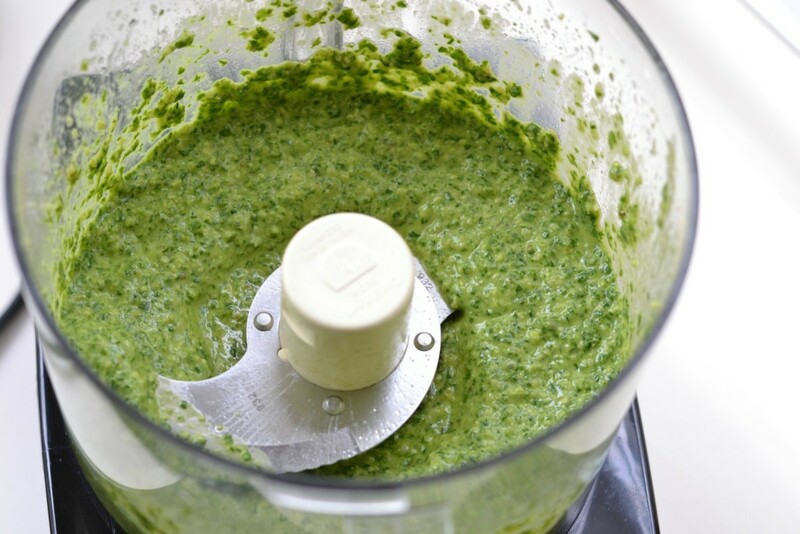 Can you make pesto without a food processor? Technically yes. You can chop everything by hand, but the texture will definitely be different, and it will be very time consuming. 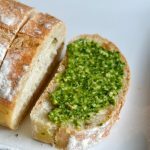 If you are up for the challenge, this article beautifully explains how to chop pesto by hand like an Italian grandmother. :) It’s actually sort of inspiring, and I might try making it this way one of these days. 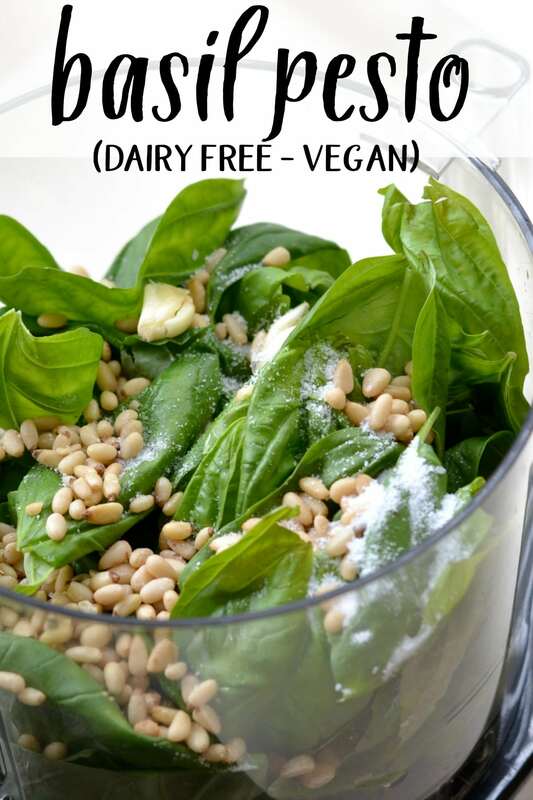 This dairy free, vegan pesto recipe is bright, lemony, and full of flavor. 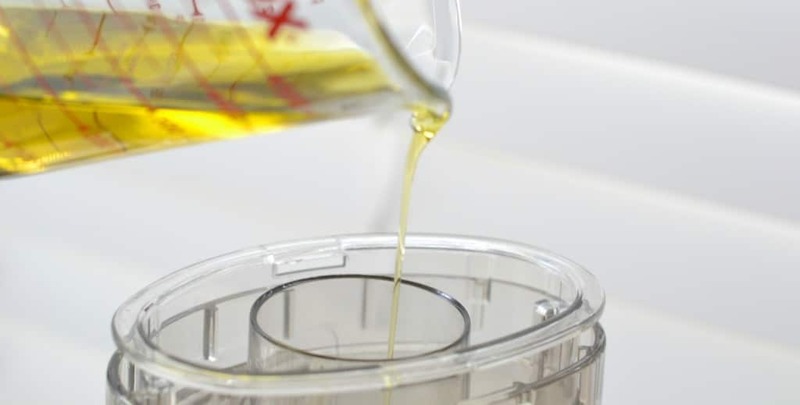 In a food processor, combine all ingredients except the olive oil. Pulse until evenly chopped. Slowly add in the olive oil through the top of the processor. Pulse until evenly combined, but not completely smooth. I would love to try this- one thing I’m wondering about tho- do you grow basil or where do you buy 3 cups of it? Its like a specialty item here in Midwest in the winter& I find I’m buying these little packets sparingly. I would have to buy all they have almost for 3 cups, i would imagine? Maybe I’m picturing packing it a little too much? Thanks for any input! Good question. During the spring/summer, I usually buy a small potted basil plant at a grocery store which lasts for a while by a windowsill or outdoors if the weather is moderate. Sometimes at Trader Joe’s they sell a large plastic container of basil (at least 3 cups worth), but I think that tends to be seasonal, too. If you can find a plant, it should last a while and you can keep it indoors if it’s cold outside. This was super simple and fast! So yummy!